Sie sieht nach ihrer Darmerkrankung wieder fröhlich und gelöst aus. 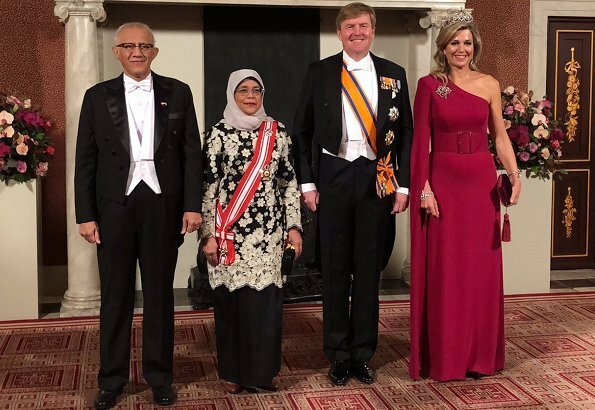 I love Maxima's outfit, jewellery and hairdo. But her beauty treatment was too much. Indeed, Katharina. Maxima looks different. Royal ladies might be wise to stop the botox and other facial "improvements", most of which are not needed. Aging gracefully can be a beautiful thing (and that goes for hair as well). Her makeup on this occasion is overdone. JMHO. The close up photo is not especially flattering when it comes to make up - she needed a matte foundation and more powder to cut down on shine. I can see absolutely no sign of Botox use - her face is still animated, her forehead has lines from movement and there is no glassy, waxy sheen to the skin. Maxima looks fantastic. Red is a great color for her and the style of the dress is flattering--love the wide belt. 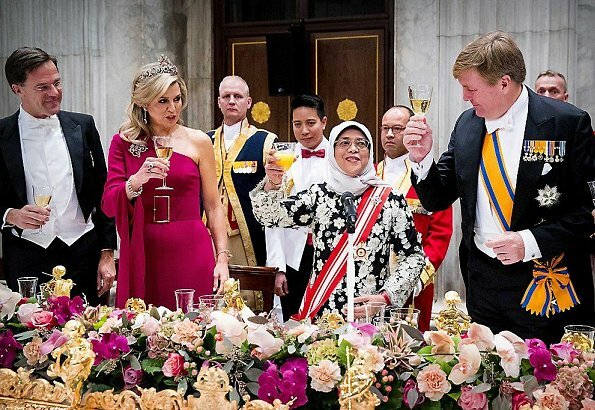 The peacock tiara suits her so well and the brooch is spectacular. That dress and style is perfect for her tall trim figure, and she does it total justice. The colour is beautiful and the matching bling is the cherry on the cake. Kudos to the Queen! 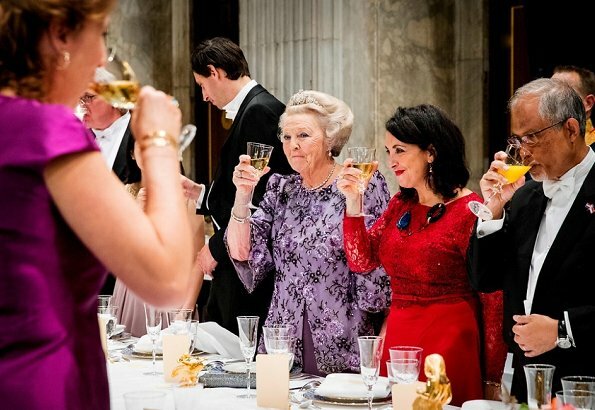 Princess Beatrix also looks great in sparkling purple and lilac. That looks like quite the celebration with everybody having a smiling good time. Maxima is fantastic in this beautiful gown which fits her to a T, and the stunning jewels to match. Princess Beatrix has such original and unique outfits which always make her really attractive. The woman in red next to her has an interesting neckpiece - I wonder what it is. Love this woman. she looks great here. I honestly don't know what women see in what I call 'half dresses'. If you're going to bare your shoulders, bare them both, otherwise, not at all. Maxima, great! Very pretty hair and dress. Love the style of the dress. One of her best. Well fitted dress, good tiara, better smile. Only thing I do not like is that stupid belt in Maxima´s dress. Those ruby jewels are to die for! Looks fab from head to toe. 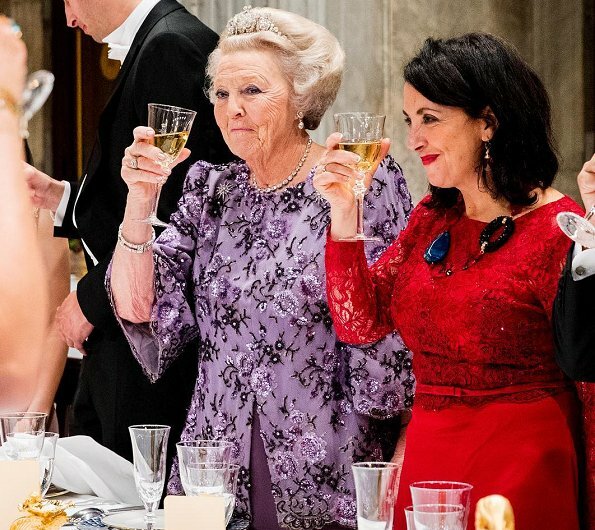 wie is die dame in het rood naast Prinses Beatrix? De voorzitter van de Tweede Kamer. I love Maxima look, the dress color and shape is so lovely and the jewels are amazing but her smile is always her best complement. 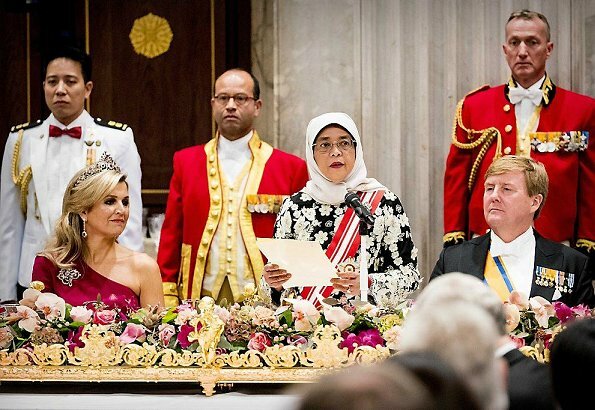 The President, Beatrix, and Maxima all look lovely in their outfits though I'm surprised Maxima would bare her shoulder at a state dinner when her guest is of the Islamic faith. Does anyone else think that she might have worn a more modest dress in deference? I know she has done so at other formal occasions. 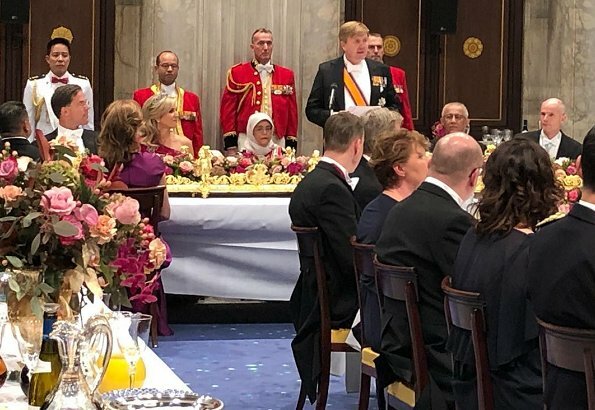 I thought there was all this protocol for state dinners, but maybe not in the selection of one's clothing? Maxima looks fantastic here. This colour really suits her. Princess Beatrix outfit is also a lovely colour and she, too, looks great. OMG she loooooks soooooo great, this look is perfection! She's really blessed with a great look, good taste and good stylists. w-o-w!! Beatrix looks also very, very nice, lovely colour for her! All of the ladies dresses look nice and bright. We all respect each others culture that's how we live in a democratic society;one must not judge the other. 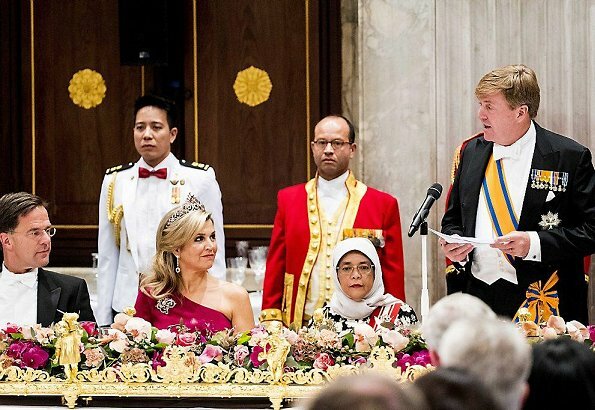 U steekt uw voorgangsters, de koninginnen Beatrix, Juliana, Wilhelmina en Emma, de loef af. Zoals u "de juwelen" draagt: formidabel. Alsof ze voor u gemaakt zijn.